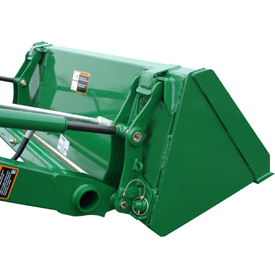 The Quik-Park mounting system on the 120R Loader is designed for easy removal and mounting to and from the tractor without tools. Just like on the former H120, the parking stand is attached to the mast. To lower it into the park position, simply move the joystick to the raise position once the latches are opened. 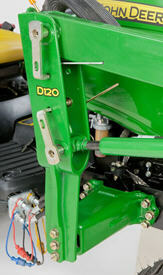 The D120 does not utilize the Quik-Park system as used on the 120R, but rather has two parking stands that are stored within the torque tube for a manual parking process. 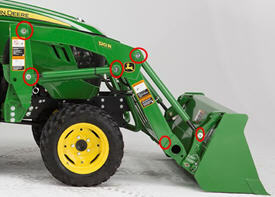 Remove the parking stand from the torque tube area and place within the loader foot plate during the parking process (as shown). Once the loader weight is being supported by the bucket and parking stands, manually remove the pins from the mast assembly and disconnect hydraulics. After installing the parking stands, removing the parking pins and disconnecting hydraulics, simply back away. Ballast box can be used to carry additional ballast for greater tractor stability. Ballast box extension is only available through parts; not a factory option. 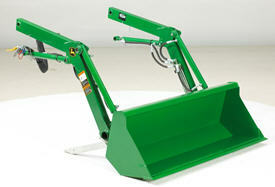 Materials buckets are available to match tractor-loader applications. The buckets may be used for loading dirt, gravel, feed, and light materials as well as scraping, digging, and other general-purpose tasks. 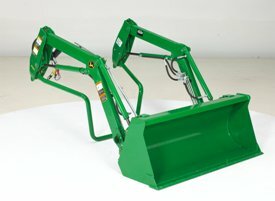 The top surface of the bucket is parallel to the cutting edge, which aids the operator as a leveling guide. There is a quik-change connection for easy on/off. 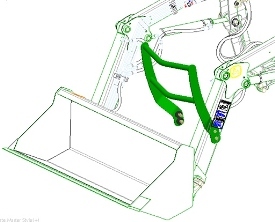 The round-back design helps material flow when filling or dumping the bucket. The 1250-mm (49.2-in.) 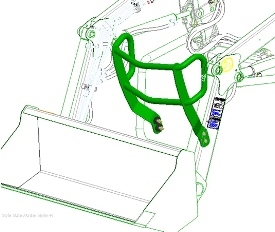 bucket is standard on the 120R Loader for field-installed orders. For loaders installed out of Augusta, GA on tractors, the base bucket will be the 1350-mm (53-in.) bucket. 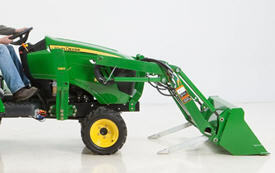 It is also compatible with the 220R Loader, as the carrier assembly is the same (but may not cover the width of the model year 2017 2R Series Tractor). When the 220R Loader is ordered factory installed on model year 2017 2R Tractors, the 1450-mm (57-in.) materials bucket is base equipment. When the 220R Loader ordered field installed (palletized), the loader ships from Augusta, GA.
For non-model year 2017 2R Tractors, the bucket and other specific configuration items will need to be ordered through Parts (such as mounting frames, and hood guard). 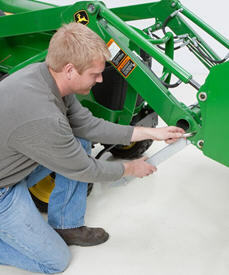 The quik-change attachment carrier allows one person to quickly change attachments without the use of tools. Simply roll the attachment back with the boom slightly off the ground, remove the retaining pins, and then roll the attachment forward and lower to the ground. To connect to another attachment simply align the attachment carrier with the hooks of the attachment, raise the boom for the carrier to engage the hooks of the attachment and rollback the attachment carrier. Then install the retaining pins and the carrier is ready to work. This provides a very effective means of changing attachments without having to purchase an option to facilitate changing attachments. Bushing kit for use with Category 1 implements (ballast box) to make them function correctly with the iMatch Quick-Hitch. 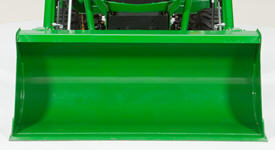 Standard on 120R Loaders, the hood guard can be ordered for a tractor without ordering a loader. 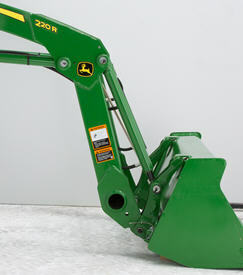 The deluxe hood guard is the same for both the D120 and 120R Loaders; however, it is only available as field-installed option for the D120 Loaders.